This online test series is excellent for those students who are willing to put regular efforts to excel at Math Olympiad exams like IMO, iMO, NIMO, IAIA - Mathematics, NSTSE etc. The tests are topic wise and the students can synchronize them with the topics being taught at school. These tests go deep in testing the concepts of a particular topic. MOT is a leading online testing platform for Olympiad preparation. You will need to have computer and internet access to access and take these tests. MOT neither provides any printed material nor the option to download or printout. 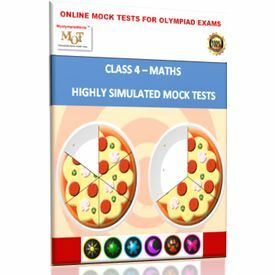 This online test series is excellent for those students who are willing to put regular efforts to excel at Math Olympiad exams like IMO, iMO, NIMO, IAIA - Mathematics, NSTSE etc. The tests are topic wise and the students can synchronize them with the topics being taught at school. These tests go deep in testing the concepts of a particular topic. Please try the FREE SAMPLE TEST for IMO / Math Olympiad exam preparation (30 questions, 1 hour) to get an idea about the quality of the tests. ( Blue button next to the product image) In this online test series, there will be 20 - 30 questions in each of the following topics: 1. Fractions - (3 tests, Part 1 - Part 3) 2. Numbers - (3 tests, Part 1 - Part 3) 3. Charts - (2 tests, Part 1 - Part 2) 4. Time - (2 tests, Part 1 - Part 2) 5. Geometry - (2 tests, Part 1 - Part 2) 6. Money - (2 tests, Part 1 to Part 2) 7. Measurements - (2 Tests, Part 1 to Part 2) 8. Multiplication & Division - (2 tests, Part 1 to Part 2) 9. Mental Ability Number of attempts for each test: 3 .. Duration of each test: between 45 minutes to 1 hour MOT is a leading online testing platform for Olympiad preparation. You will need to have computer and internet access to access and take these tests. MOT neither provides any printed material nor the option to download or printout.